A dove is gently nestled into this Custom Heart Pendant. Do you have a different idea for a Custom Heart Pendant? Send it over to us and we will see what we can do for you. It will cost less and be easier than you might think! 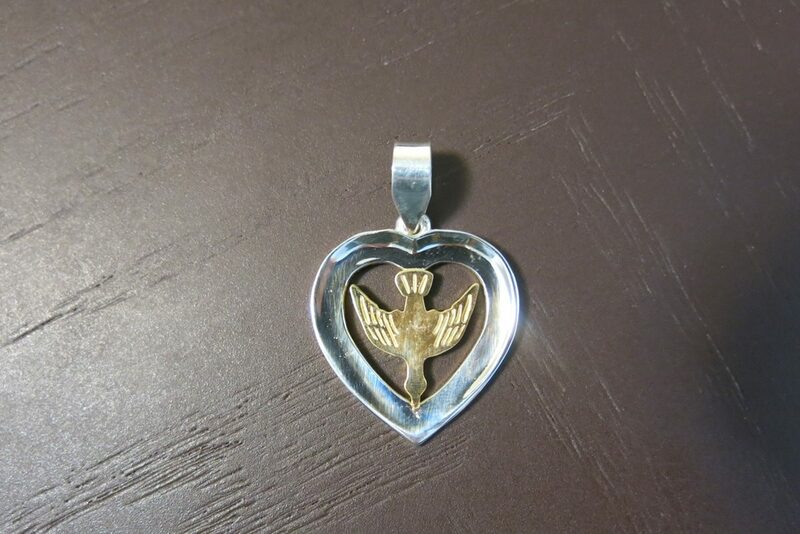 This 2 Tone Heart Dove Pendant was almost 1.5 inchaes tall with the bail and about 3/4 of an inch wide. We can cast custom pendants in Bronze, Brass, Copper, Sterling or Argentium Silver, white, yellow, or rose Gold, Palladium or Platinum. This dove was plated with Gold, but it could also be cast in Gold and soldered to the white piece if you want it to be permanently Gold. Otherwise, the plating isn’t permanent. If you want some color added, it can be done with both gemstones and enamel, allowing for an even higher level of personalization. Click HERE for another Custom Heart Pendant design.